The PayPal Standard payment gateway will allow your attendees/registrants to pay for their event registration with a PayPal account. If guest checkout is enabled, then they can also pay with a bank card. Need to Buy a Support License for Event Espresso 4 (includes PayPal Standard)? No installation is required. The PayPal Standard payment gateway is included with the Event Espresso 4 core plugin. You can add the above to a functions plugin, or into your WordPress theme’s functions.php file. 1) Login to your PayPal.com account. 4) Click on the second option for Classic (NVP/SOAP). If you have used PayPal Express for other projects, then you’ll have existing credentials that you can click to view and then copy into Event Espresso and save changes. If this is a new account, then you can request the credentials. Continue with the steps below. 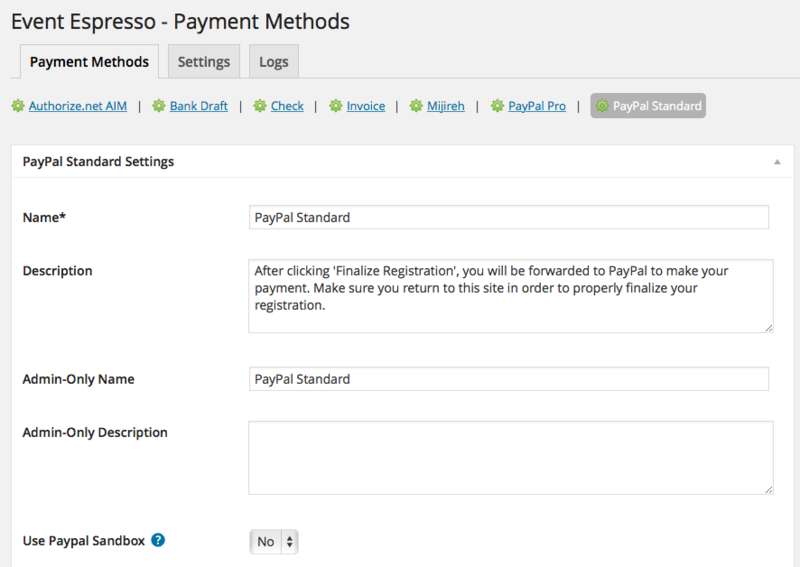 8) Login to your WordPress dashboard (WP-admin) and go to Event Espresso –> Payment Methods –> PayPal Express. Click the button to enable the payment method. You can then copy and paste the API username, password, and signature into the payment methods page and save changes. 9) You’ll now want to verify that your PayPal Express payment method is ready to go. You can do this by starting a registration for an event and selecting PayPal Express during registration checkout and continuing to the PayPal.com page. If you are able to reach the PayPal.com page, then your credentials from your PayPal.com account are correct. If you see an error, then please double-check your credentials and update them and try again. 10) Now that you have confirmed that PayPal Express is working, you can deactivate PayPal Standard through the payment methods page (Event Espresso –> Payment Methods) by clicking on the button to deactivate the payment method. An account with PayPal is needed to accept payments via PayPal Standard. Need an account? Call this number to get started: 1-855-456-1338. Login to your WP-admin (WP Dashboard) and go to Event Espresso –> General Settings –> Payment Methods. Once on the Payment Methods screen, click on PayPal Standard and click on the button to activate the payment method. Use PayPal Sandbox? – Enables debugging for this payment method. It should be off (set to no) on a live/production site. PayPal Email – This credential is needed to process payments and is the email that you use to login to your PayPal.com account. Image URL – This image is used on the PayPal.com page and appears in the top left area of the screen. This is helpful for branding your payment page. Shipping Address Options – Specific the option for how addresses should be handled: Do not prompt for an address, Prompt for an address but do not require it, Prompt for an address and require it. You can then enter your PayPal.com email in the payment methods page for Event Espresso within your WP dashboard and then click on the Update Settings button. 4) Locate Instant payment notifications and then find the text that says “Integrate PayPal payment notifications with my website.” Now click on the Update link next to it. Then select the Receive IPN Messages (Enabled) option and click on Save. 4) Locate Website Preferences and then find the text that says “Bring customers back to my website after they pay with PayPal.” Now click on the Update link next to it. 6) Scroll to the end of the page and click on Save. The PayPal Standard payment gateway will let you accept payments on PayPal.com. This is an offsite payment gateway which means that attendees/registrants are transferred over to a secure PayPal.com page to process their payment. They are then returned to your site to view their registration confirmation. An account with PayPal is needed to accept payments via PayPal Standard. I configured PayPal Standard and payments are not being updated in Event Espresso. Can you help? The PayPal IPN is needed to update payments. Please see the steps in the Usage section of this article. When I refund a payment, does it also refund through PayPal.com? Refunds in Event Espresso 4 are currently a two step process. First, apply the refund through the transactional details screen of Event Espresso in your WP-admin (WP dashboard). Then login to your PayPal account and process the refund. My attendees/registrants have to click a link on PayPal.com to get to my site after paying. How do I make PayPal.com return them to my site automatically? The PayPal Auto Return option will handle this for you. Please see the steps in the Usage section of this article. How can I setup a recurring payment or subscription through PayPal Standard? Recurring or subscription payments are not currently supported in the PayPal Standard payment gateway. Is an SSL certificate needed for PayPal Standard? PayPal Standard is missing. Can I still use it? PayPal Standard has been removed by default from Event Espresso 4, because the PayPal Standard service is not as reliable as the PayPal Express service and should be avoided in mission critical environments.